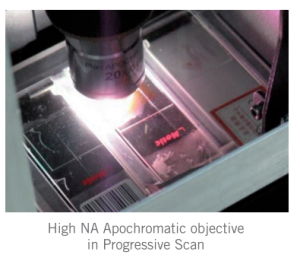 Negative control sera and isotype controls are employed in place of primary antibody for staining negative control slides. Negative control slides void of staining verifies the staining specificity of the primary antibody for the target antigen as stained in positive control and case slides. Innovex Biosciences offers a wide selection of negative control sera and isotype controls for different sources of primary antibodies employed. Please click this icon to download the PDF file. Innovex Enhancing Wash Buffers only require 5 seconds rinse in between incubation steps when used with Innovex STAT-Q and HISTO-STAT ( 2-step) staining systems. Innovex Enhancing Wash Buffers may be employed with other systems, observe the manufacturer’s instruction for the required time and number of washes recommended for the system. Innovex Enhancing Wash Buffers can be used for washing ELISA plates, however, some non-ionic detergent should be added to the solution. UNI-TRIEVE is a Mild -temperature Universal Retrieval Solution that retrieves for all antibodies, all human and all animal tissues at only 65-70 degrees celsius in 30 minutes using a simple water bath. UNI-TRIEVE ; is Totally Background -Free and unlike citrate buffe, High pH buffers, pressure cookers or microwaves, no background or tissue damage or loss is observed with Uni-Trieve. 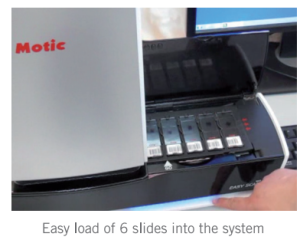 UNI-TRIEVE standardizes retrieval, it retrieves all tissues with a single solution. UNI-TRIEVE's gentle temperature makes it an absolute must for retrieving for immunofluorescence, delicate tissues such as brain, bone marrow and animal tissues. UNI-TRIEVE is Background-free and it is the retrieval of choice for Immunofluorescence (IF). OVER-NIGHT Retrieval is now possible with UNI-TRIEVE: simply immerse sides in 40-45 degrees celcius Uni-Trieve using a water bath as the heat source. Next morning remove slides from the water bath , rinse and proceed with IHC or IF staining. pH-independent .One single solution retrieves all tissues for all antibodies. Total retrieval time of time of 45 minutes at 75-80 degrees celcius for nuclear antigen such as ki-67, ER, PR , etc. A must for cell line preps and delicate tissues such as brain , bone marrow and animal tissues. Can be used three times before needing to be discarded. “H&E Mount” is a unique, permanent mounting media designed for coverslipping H&E stains from water or alcohol. “H&E Mount” hardens quickly and mounted slides are ready for microscopic examination in 10 minutes. (5-10) in eosin is recommended. •Fc receptors是一種glycoproteins, 存在於血液中B細胞、單核細胞、及顆粒細胞。與抗體中Fc region具高親和力，造成非專一性及背景值形成 去除所有非專一性及背景值的問題 針對血液、骨髓或淋巴組織最適用! Innovex Fc Receptor Block is a peerless technology designed to block Fc Receptors present on all leukocytes (white blood cells), lymphomas, and melanomas. Fc receptors are also expressed on a majority of tumors. Blocking Fc receptors is essential for accurate typing of lymphoid and tumor tissues and cells. Fc receptor staining occurs by the binding of Fc receptors present on cell to the Fc region of the primary and/or secondary antibody. Fc Receptor Block can be used for IHC (frozen and paraffin) flow cytometry, immunoflorescence and in-situ hybridization and for live cell functional assays. Fc Receptor Blocker is a must for accurate lymphoma and leukemia typing. 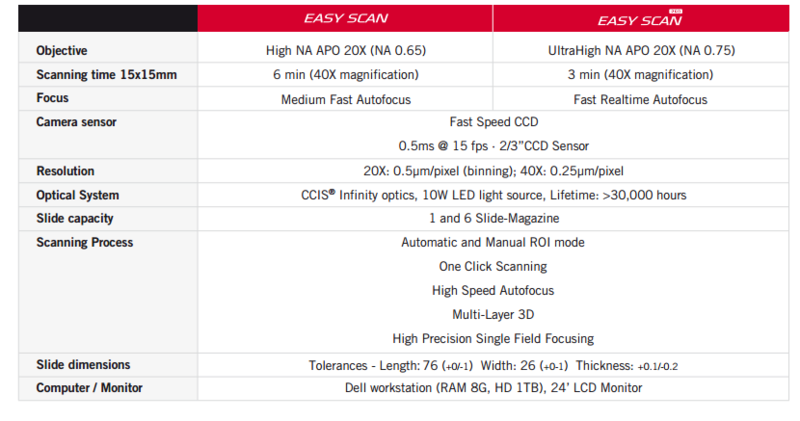 Please click this icon to download the data sheet in PDF file. 組織內大量存在Fc receptors；Fc receptors是一種glycoproteins, 存在於血液中B細胞、單核細胞、顆粒細胞 dendritic細胞。組織內Fc receptors與抗體中Fc region具高親和力，FcRs-mediated Ig Fc binding 造成非專一性及背景值形成。Fc receptor也是大量存在大部份的腫瘤細胞組織中，因此在免疫組織染色IHC (frozen and paraffin)、流氏細胞分析 flow cytometry, 免疫螢光染色 immunoflorescence 及原位雜合反應試 in-situ hybridization，會使用Fc receptor Blocker 除去抗體Fc region所有非專一性及背景值的問題，尤其是處理血液、骨髓或淋巴的組織!!! Fc receptors are also expressed on a majority of tumors. Blocking Fc receptors is essential for accurate typing of lymphoid and tumor tissues and cells. Fc receptor staining occurs by the binding of Fc receptors present on cell to the Fc region of the primary and/or secondary antibody. Fc Receptor Block can be used for IHC (frozen and paraffin) flow cytometry, immunoflorescence and in-situ hybridization and for live cell functional assays. 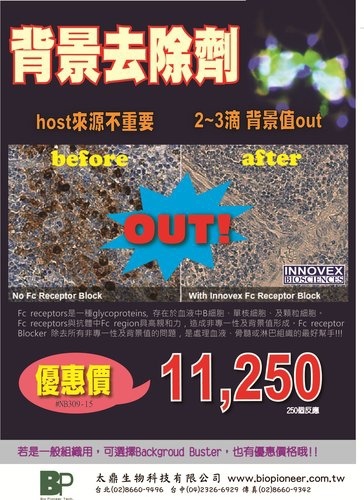 【太鼎生物科技有限公司】代理INNOVEX BIOSCIENCES Background Buster 與Fc RECEPTOR BLOCK如何降低IHC背景值? Background Buster is highly effective for quenching background fluorescence. Apply Background Buster for 15 minutes prior to application of the first antibody (unlabeled or fluorescence-labeled antibody). Rinse with PBS for 1 minute. Apply unlabeled antibody for indirect method or fluorescence labeled antibody for direct method and continue with usual protocol. 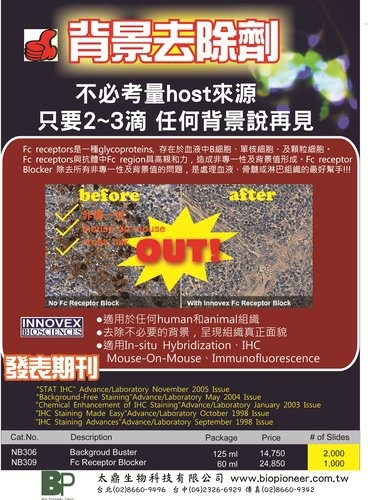 Background or non-specific staining is often observed in a variety of immunoassays, in immunohistochemistry and other immunoassay types such as immunofluorescence, ELISA and flow cytometric assays, background staining can be prevented by the use of INNOVEX Recombinant Protein Technology, Background Buster. 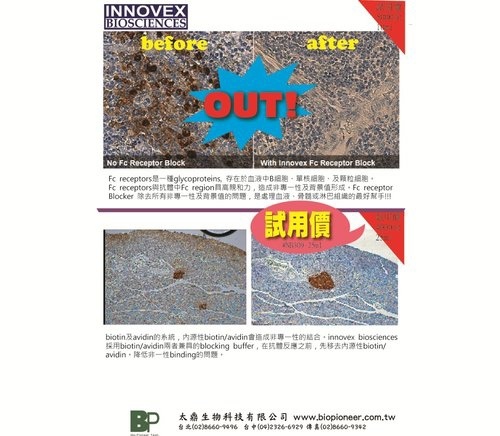 Innovex Background Buster is a diverse and powerful RECOMBINANT PROTEIN TECHNOLOGY for eliminating general background staining in tissues and cell preparations stained with antibodies in immunohistochemistry or with DNA or RNA probes for in-situ procedures. It also makes possible the staining of mouse antibodies on mouse tissues. Background Buster is also applicable to eliminating non-specific binding in immunofluorescence, ELISA and flow cytometric assays. • Allows staining of identical species antibodies and tissues (e.g., mouse antibody on mouse tissue, rat-on-rat, rabbit-on-rabbit, etc. ).